We finished the Tanami Track sometime around noon Western Australia (WA) time. This was earlier than we were expecting since we gained one and a half hours. How did we gain one and a half hours? Good question. The Northern Territory and South Australia are both at UTC + 9.5. WA is more conventional with its time zone being UTC + 8, hence, the 1.5 hours change. This is the only place I have been with a fractional hour time zone. We arrived in Bililuna which looks pretty run down with trash all over the ground, dogs in the road, and kids driving around in vehicles with the windows all broken out. We drove around for a several minutes looking for the gas station and store, but only spotted a big steel box resembling a shipping container with gasoline filling hoses. After speaking with a local gentleman, we found out that the big metal box was a fuel tank with integrated pumps and filler hoses. Unfortunately, the gas station was closed until 2pm. The man suggested we head down to Stretch Lagoon to wait instead of driving up to Halls Creek. We decided to follow his advice. 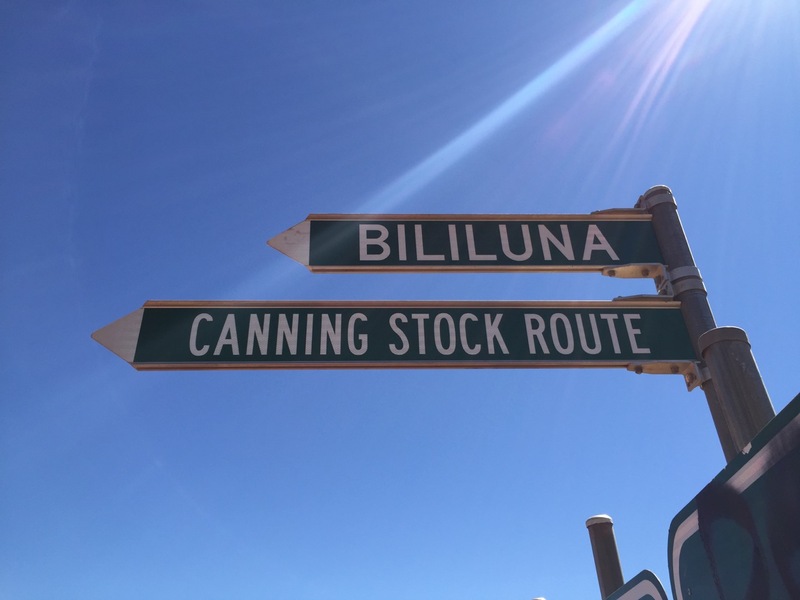 As we started driving the road, it was signed as the Canning Stock Route (CSR). Our adventurous drive had begun! We saw two 70 series Land Cruisers coming the opposite direction go down the turn off for Stretch Lagoon. We followed them in. These were the first people we encountered on the CSR! We chatted with the two couples for an hour while eating lunch. They had just finished the CSR. They took 3 weeks and said it was wonderful. They gave us some good information of places to see and about a town a little off the track that had fuel and a community store. Even though they were taking it relatively slow and steady, they still had a relatively big mechanical issue. 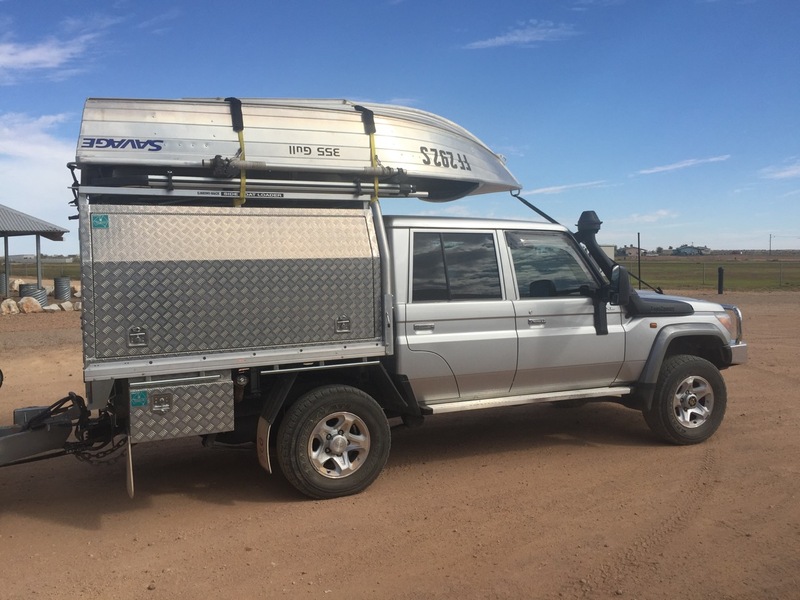 One couple’s Land Cruiser was a tray back Ute. Essentially, a pickup truck with a flat bed. On top of the flat bed, they had a large utility box that had been damaged. It was due to the excessive overhang on the rear causing a bad departure angle. This caused them to pound the back of the box every time they embarked onto or crested over steep dunes. Luckily they were able to shove the box up closer to the cab by eliminating the space between that was used to carry spare wheels and Jerry cans. They then went on top of the box. After eating lunch and chatting with the couples for a while, Ryan and I decided to drive to Mulan to fuel up and get some supplies before heading back out to the Canning. We arrived in the town, purchased gas, water, eggs (since we seemed to have misplaced an entire dozen), and yogurt. Since we planned to spend the night near Lake Gregory which requires a permit and a fee, we found the local Ranger and asked if the Canning permit was sufficient or did we need to pay a fee. He said we were fine and we were off. We spent 10 minutes driving around looking for the way out of town. This included driving through the elementary school’s playground. We asked some helpful locals who put us on the right track to the Lake Gregory campground. It was dark enough to need lights at this point. So, we were slow going. It was solidly dark when we got to the campground. We were pleasantly surprised to find no one at the free campground on the eastern edge of Lake Gregory. From what we could tell, there was a level area with many gum tress and a couple of pit toilets with corrugated metal enclosures. One had some BM on the seat. LeeWhay just never understands how that happens. The other one had a huge spider on the seat. So, LeeWhay decided to partake in a nature toilet instead. We also encountered a white gecko who was missing a hand. He startled LeeWhay at first, but after she jumped back, she realized he was pretty cute. We set up camp and turned in for the night. This was our first night on the Canning! There is no elementary school here at Mulan, and no way you could have driven through the school playground. Why post such negative information that is untrue anyway. Marc, we found ourselves in a place that looked like a playground, maybe a park. We thought we were on a road, that ended up not being a road and we turned around. This was from our point of view and we were not familiar with Mulan. Some of the locals assisted us and we were able find our way out of the town. It was not meant to be negative and we are sorry you took it that way.